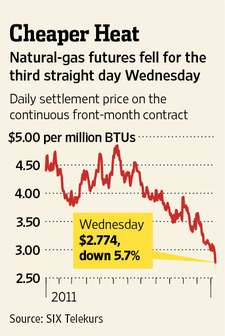 The good news for the consumer is that “experts” predict rock-bottom natural-gas prices through at least 2013. “We’re anticipating sustained low gas prices,” says Andy Steinhubl, from Bain & Co.’s North American oil and gas practice. This from The Wall Street Journal…..
U.S. energy companies are pumping so much natural gas out of the ground that prices are plummeting, and the cheap gas isn’t likely to evaporate anytime soon. Natural-gas prices fell 5.7% Wednesday to their lowest level in over two years—good news for people who use gas to heat homes and for companies that use it to power factories. For U.S. energy companies, however, the domestic natural-gas market is looking increasingly out of whack. Despite a 32% drop in prices last year, onshore production rose 10%, and it is expected to rise another 4% this year, according to Barclays Capital. As a result, prices are expected to remain low for at least the next couple years. Earlier this week, Bank of America Merrill Lynch said gas prices could drop below $2 in the fall, a level unseen since 2002. Four years ago, it sold for around $9. 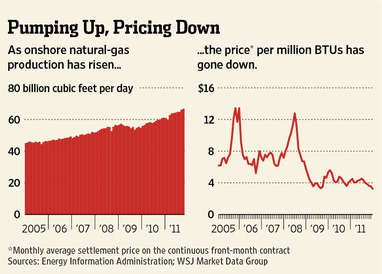 Many experts predict rock-bottom natural-gas prices through at least 2013. “We’re anticipating sustained low gas prices,” says Andy Steinhubl, co-head of consultancy Bain & Co.’s North American oil and gas practice. le progrès et l’appropriation des valeurs universelles sont les seules armes contre les défis actuels et à venir. La citoyenneté est une attitude, un état d’esprit, la conviction émotionnelle que le tout est plus grand que la partie.. CORPS DES INGÉNIEURS DU PARTI DU Parti du RNI. CORPS DES INGENIEURS DU PARTI RNI RNI – RASSEMBLEMENT NATIONAL DES INDÉPENDANDANTS. CORPS DES INGÉNIEURS DU PARTI DU RNI, ORGANISATION PARALLÈLE DU PARTI RNI – RASSEMBLEMENT NATIONAL DES INDÉPENDANDANTS.